This is the safe option to use for bathrooms with four inch square tiles - the norm! You can install in minutes without tools or permanent hardware. There is no need to hire a professional, you can do this yourself! Install and remove anytime, just about anywhere. Use with bathtubs and showers. Take it with you on your vacations; great for use in hotels, rental cottages or visiting friends and relatives. 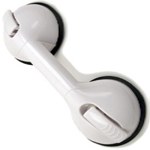 The extra strong suction grip bar has a telescoping handle which extends to adapt to most any tile configuration. Tested and approved by health professionals including orthopedic surgeons and occupational therapists. Both ends of the 4" suction grip bar has 3.7" diameter rubber suction cups which provide a very strong hold. Fits most standard four inch tiles in any configuration. Easy installation with the Quick Bar 500 Suction Cup Grab Rail. So easy you can take it with you when you travel. 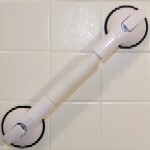 The red and green safety indicators will show if you have achieved a good suction seal on your grab bar. 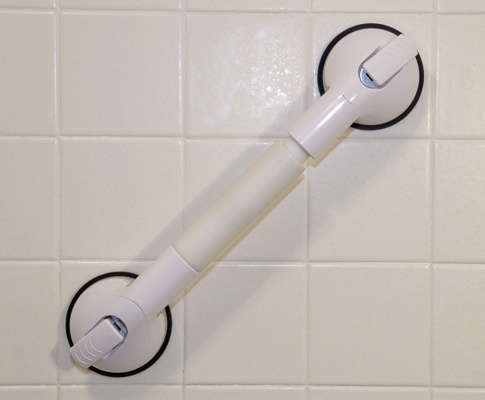 Portable and quick and easy to install, this Suction Cup Balance Grab Bar adheres to any smooth surface without the use of tools or the damage of drilling. Provides the ideal amount of balance stability and assistance whether at home or while traveling.